The critically acclaimed hit is back with an all-new adventure that will quickly teach the Freshmen whats at stake when you put on a costume! Wannabe, the powerless team leader who has always dreamed of being a superhero, is having visions of the eccentric Mr. Fiddlesticks, a character from a series of childrens books. But what does it mean? Is Mr. Fiddlesticks warning Norrin of danger, or bringing it himself? Also: How can Drama Twin Brady break away from his toxic romance with Renee? And will the drunken Intoxicator ever be able to pass a class? 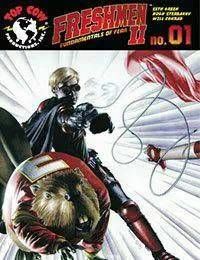 Co-created by Buffy and Italian Job star Seth Green and written by Mister Girth himself, Hugh Sterbakov, Freshmen II is an uproarious combination of superpowers and college - with a talking beaver!